It may be more commonly associated with lager louts or warm bitter, but the UK has become the world's biggest importer of wine, according to new figures. 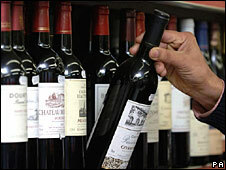 Imports topped 1.6bn bottles in 2007, according to the industry body Vinexpo. Wine from Australia proved most popular among British drinkers, ahead of French and American imports, it said. Adults are likely to get through 28.3 litres a year on average, well short of the world's most prolific wine drinkers - the French - who sink 58.8 litres. Despite the increasing quantities of wine flowing into the UK, the industry has not escaped the effects of the economic downturn. Sales dropped by more than 3.5% in the first nine months of 2008, largely due to falling sales in pubs. Annual growth in the wine market is expected to halve to 6% by 2012 although consumption will still increase, the Vinexpo report said. White wine will increase in popularity from an estimated 764 million bottles last year to 823 million by 2012 and rose sales are expected to rise by almost 50% to 220 million. Britons got through 720 million bottles of red in 2008 but this is expected to fall to 687 million by 2012. Meanwhile, Scotch is continuing to lose out in the popularity stakes to the UK's favourite spirit - vodka. Vinexpo, which organises the world's biggest wine and spirits exhibition, said sales of whisky dropped 11% between 2003 and 2007 and will continue falling. In 2007, Britons bought 96 million bottles of vodka and that is predicted to rise by a fifth in the next three years. Don't know your Merlot from your elbow?